See my full review & photos at = https://chefquak.com/2016/04/30/good-scissor-cut-curry-rice-at-toa-payok-lor-8-food-centre-on-30apr2016/after the scissor cut curry rice lunch, my friend went to get the chendol, the stall that former PM mr Goh Chok Tong likes.this the really authentic version. 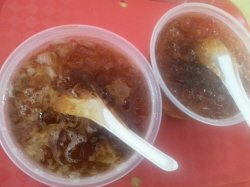 very nice kidney beans, quite a lot of palm fruits (atap chee) & very flavourful gula melaka & coconut milk.one of the best chendol i had, very nice, really enjoyed it! 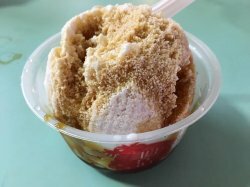 after the scissor cut curry rice lunch, my friend went to get the chendol, the stall that former PM mr Goh Chok Tong likes. this the really authentic version. very nice kidney beans, quite a lot of palm fruits (atap chee) & very flavourful gula melaka & coconut milk. one of the best chendol i had, very nice, really enjoyed it! 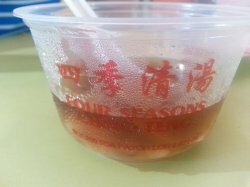 i love their cold cheng teng which makes the hot weather in Singapore more bearable.Their cheng teng are priced at $2 each and you can have it cold with shaved ice or simply hot.They serve all their cheng teng in plastic containers be it having there in the market or takeaway.I love their cheng teng as it is not too sweet and even though it is priced at $2 each,you get a bowl of authentic heartening good olden days flavoured cheng teng here.